Happy Earth Day from the Philippine Sea! The drill heads have a limited life before the cutting bits and bearings are worn away. The expertise of the drilling crew is paramount when it comes to deciding when the point has come to stop drilling. If we were to push on until the drill head broke up inside the hole it would mean that we could not drill any deeper, and the hole would have to be abandoned. So the crew remove section after section from the top of the drill string until the head is just below the sea bed (1000m in this case). Each section of drill pipe is 30metres in length. They are unscrewed from the top of the string and neatly stacked on the ship awaiting re-use. 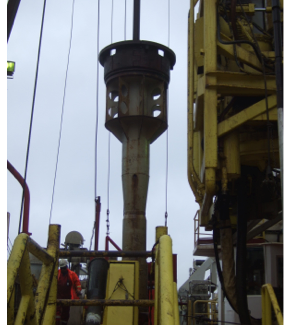 The hole isn’t very big in the middle of an ocean floor, so a re-entry cone is slid down the drill string where it embeds itself into the top of the hole, standing a little bit proud of the soft sediment so it doesn’t fill up and get lost! Another length of drill pipe is now removed to pull the drill head completely clear of the cone, and then the ship is carefully moved away from the hole by about 40m. The worn drill bit is then released from the bottom of the string to end its days slowly being encased in detritus from the water column. Who knows if in the far distant future some other drilling ship will come along and discover this artifact from a previous civilization? Then the fun begins! The ship has to move 40m back to its original drill position and try to get the end of the drill pipe into the top of the re-entry cone! They lower the camera equipment down to the bottom and stream the murky images back to the ship where it is painful to watch the pipe slowly edging nearer and nearer, a few cm at a time, and then slowly lowered into the hole. It is like golfers watching an important shot on the putting green that might earn them the title – slowly rolling just past the hole again and again until at last there is success! All this time the ship at the surface is fighting wind, waves and ocean currents and trying to move just centimetres at a time. At the point of success there is a palpable sense of relief from all who are watching from above! Achieving this task has been likened to trying to maneouvre a drinking straw, the height of the Empire State Building, into a coffee cup somewhere at the base! At this point, without a drill head, the drill pipe is extended a short distance into the hole and then a cable lowered through it with a ‘sonde’ attached. A sonde is a long thin metal container with scientific measuring equipment in it. The sonde is lowered as far down into the hole as possible. Sometimes holes can collapse but we have been lucky this time – the sonde got to within 30m of the bottom – not bad for a 1000m hole! As the sonde is lowered and then pulled back up the equipment can take measurements including NGR (Natural Gamma Radiation) from radioactive minerals like Uranium, Thorium and Potassium, electrical resistivity (to measure the water or organic material within the rocks), and seismic properties (how fast sound waves travel through the rock) which gives information about density. Other tests can look for faults, folds, bedding planes and other structures which help scientists to correlate the cores that have been brought up and which bits have been lost during the coring process. This process is called ‘downhole logging’ and is also extensively used in minerals exploration and civil engineering projects. After 3 separate logging runs have occurred the whole drill pipe has to be pulled, section by section, onto the ship to allow a new drill head to be attached and the whole drill string lowered back down to find the re-entry cone again! So once again we will all be hanging over the video screens with baited breath. Three cheers for the amazing crew who can perform these amazing feats!